Today I arrived in New York at the Doubletree Metropolitan on Lexington Ave. I got to the hotel around 6 pm after flying from Denver and wanted to grab a shower. Now I have been a frequent traveler for over 10 years and must have stayed at a 1,000 different hotels over that time and have never been stumped by a shower. 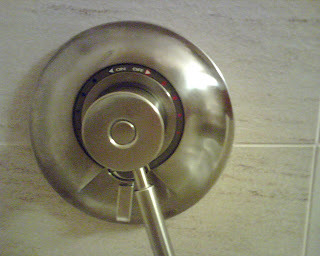 The shower control had this mystery ring that looked like it turned on the shower. Actually the shower control had three different levers on it and I guess I didn't try the one that actually turned the shower on because I ended up calling engineering to fix my shower. Of course when they showed up and said you slide the lever on the bottom to turn the shower on I felt like an idiot, but in my defense, there were three levers on this thing and the other two do absolutely nothing. Just goes to show you that no matter how many hotels you stay at, once in a while you get stumped. The other mystery I faced at the hotel was "where is the coffee maker". There are two things that will drive me nuts at a hotel, no paper and no coffee in the morning. I must have spent 30 minutes going through everything in the room looking for the coffee maker before figuring out that there was no coffee maker!!!!!!! At least there is a starbucks in the lobby so I guess I will shuffle down to the lobby in the morning with my duck slippers on and get a latte. After spending an hour looking and figuring out things in the room I am starting to think that maybe I am just jet lagged.